Guido recently felt he needed to re-empathize that there will be no Python 2.8. 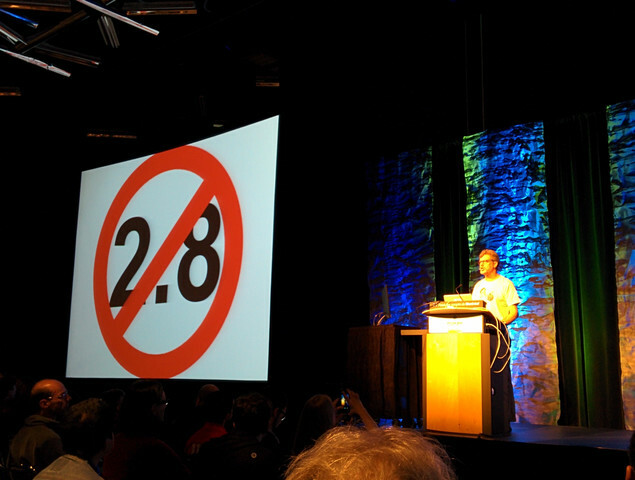 The Python developers have been very clear for years that there will never be a Python 2.8. We (I) still don't want to do a 2.8 release, and I don't want to accelerate 3.5, but I do think we should make things better for people who have to straddle Python 2 and 3 in a single codebase, by developing more tools, and by security and possibly installer updates to 2.7 (PEP 466). +There will be no Python 2.8. The call for Python 2.8 is strong. Even Guido feels it! People talk about a Python 2.8, and are for it, or, like Guido, against it, but rarely talk about what it should be. So let's actually have that conversation. Why talk about something that will never be? Because we can't call for something, nor reject something if we don't know what it is. What is Python 2.8 for? Python 2.8 could be different things. It could be a Python 2.x release that reduces some pain points and adds features for Python 2 developers independent from what's going on in Python 3. It makes sense, really: we haven't had a new Python 2 feature release since 2010 now. Those of us with existing large Python 2 codebases haven't benefited from the work the language developers have done in those years. Even polyglot libraries that support Python 2 and 3 both can't use the new features, so are also stuck with a 2010 Python. Before Python 2.7, the release cycle of Python has seen a new compatible release every 2 years or less. The reality of Python for many of its users is that there has been no feature update of the language for years now. But I don't want to talk about that. I want to talk about Python 2.8 as an incremental upgrade path to Python 3. If we are going to add features to Python 2, let's take them from Python 3. I want to talk about bringing Python 2.x closer to Python 3. Python 2 might never quite reach Python 3 parity, but it could still help a lot if it can get closer incrementally. In the discussion about Python 3 there is a lot of discussion about the need to port Python libraries to Python 3. This is indeed important if you want the ability to start new projects on Python 3. But many of us in the trenches are working on large Python 2 code bases. This isn't just maintenance. A large code base is alive, so we're building new features in Python 2. Important to some organization. Important enough for people to actually pay developers money to work on Python code. Cannot be easily ported in a giant step to Python 3, even if all external open source libraries are ported. Porting would not see any functional gain, so the organization won't see it as a worthwhile investment. Porting would entail bugs and breakages, which is what the organization would want to avoid. You can argue that I'm overstating the risks of porting. But we need to face it: many codebases written in Python 2 have low automatic test coverage. We don't like to talk about it because we think everybody else is better at automated testing than we are, but it's the reality in the field. We could say, fine, they can stay on Python 2 forever then! Well, at least until 2020. I think this would be unwise, as these organizations are paying a lot of developers money to work on Python code. This has an effect on the community as a whole. It contributes to the gravity of Python 2. Those organizations, and thus the wider Python community, would be helped if there was an incremental way to upgrade their code bases to Python 3, with easy steps to follow. I think we can do much more to support such incremental upgrades than Python 2.7 offers right now. Besides helping Python 2 code bases go further step by step, Python 2.8 can also help those of us who are maintaining polyglot libraries, which work in both Python 2 and Python 3. If a Python 2.8 backported Python 3 features, it means that polyglot authors can start using those features if they drop Python 2.7 support right there in their polyglot libraries, without giving up Python 2 compatibility. Python 2.8 would actually help encourage those on Python 2.7 codebases to move towards Python 3, so they can use the library upgrades. Of course dropping Python 2.x support entirely for a polyglot library will also make that possible. But I think it'll be feasible to drop Python 2.7 support in favor of Python 2.8 much faster than it is possible to drop Python 2 support entirely. I've seen Python 3 developers say: but we've done all we could with Python 2.7 already! What do you want from a Python 2.8? And that's a great question. It's gone unanswered for far too long. We should get a lot more concrete. What follows are just ideas. I want to get them out there, so other people can start thinking about them. I don't intend to implement any of it myself; just blogging about it is already breaking my stress-reducing policy of not worrying about Python 3. Anyway, I might have it all wrong. But at least I'm trying. Here's a paradox: I think that in order to make an incremental upgrade possible for Python 2.x we should actually break existing Python 2.x code in Python 2.8! Some libraries will need minor adjustments to work in Python 2.8. I want to do what the from __future__ pattern was introduced for in the first place: introduce a new incompatible feature in a release but making it optional, and then later making the incompatible feature the default. Python 2.7 lets you do from __future__ import something to get the interpreter behave a bit more like Python 3. In Python 2.8, those should be the default behavior. In order to encourage this and make it really obvious, we may want to consider requiring these in Python 2.8. That means that the interpreter raises an error unless it has such a from __future__ import there. absolute_import appears to be uncontroversial, but I've seen people complain about both division and print_function. If people reject Python 3 for those reasons, I want to make clear I'm not in the same camp. I believe that is confusing at most a minor inconvenience with a dealbreaker. I think discussion about these is pretty pointless, and I'm not going to engage in it. I've left out unicode_literals. This is because I've seen both Nick Coghlan and Armin Ronacher argue against them. I have a different proposal. More below. What do we gain by this measure? It's ugly! Yes, but we've made the upgrade path a lot more obvious. If an organisation wants to upgrade to Python 2.8, they have to review their imports and divisions and change their print statements to function calls. That should be doable enough, even in large code bases, and is an upgrade path a developer can do incrementally, maybe even without having to convince their bosses first. Compare that to an upgrade to Python 3. We can't do everything with the old future imports. We want to allow more incremental upgrading. So let's introduce a new future import. is interpreted as a new-style class. This might break the contract of the module, as people may subclass from this class and expect an old-style class, and in some (rare) cases this can break code. But at least those problems can be dealt with incrementally. And the upgrade path is really obvious. Why did I write __future3__ and not __future__? Because otherwise we can't write polyglot code that is compatible in Python 2 and Python 3. Python 3.4 doesn't support from __future__ import new_classes. We don't want to wait for a Python 3.5 or Python 3.6 to support this, even there is even any interest in supporting this among the Python language developers at all. Because after all, there won't be a Python 2.8. That problem doesn't exist for __future3__. We can easily fake a __python3__ module in Python 3 without being dependent on the language developers. So polyglot code can safely use this. Back to the magic moment of Nick Coghlan and Armin Ronacher agreeing. Let's have a from __future3__ import explicit_literals. This forces the author to be entirely explicit with string literals in the module that imports it. "foo" and 'foo' are now errors; the module won't import. Instead the module has to be explicit and use b'foo' and u'foo' everywhere. What does that get us? It forces a developer to think about string literals everywhere, and that helps the codebase become incrementally more compatible with Python 3.
you get a str function that creates a Python 3 str. This string has unicode text in it and cannot be combined with Python 2 style bytes and Python 3 style bytes without error (which I'll discuss later). if from __future__ import explicit_literals is in effect, a bare literal now creates a Python 3 str. Or maybe explicit_literals is a prerequisite and from __future3__ import str should error if it isn't there. I took this idea from the Python future module, which makes Python 3 style str and bytes (and much more) available in Python 2.7. I've modified the idea as I have the imaginary power to change the interpreter in Python 2.8. Of course anything I got wrong is my own fault, not the fault of Ed Schofield, the author of the future module. oldbytes` can be called with Python 2 str, Python 2 bytes and Python 3 bytes. It rejects a Python 3 str. I'll talk about why it can be needed in a bit. Yes, __past__ is another new namespace we can safely support in Python 3. It would get more involved in Python 3: it contains a forward port of the Python 2 bytes object. Python 3 bytes have less features than Python 2 bytes, and this has been a pain point for some developers who need to work with bytes a lot. Having a more capable bytes object in Python 3 would not hurt existing Python 3 code, as combining it with a Python 3 string would still result in an error. It's just an alternative implementation of bytes with more methods on it. This is the equivalent import for getting the Python 3 bytes object. So what happens when we somehow combine a Python 3 str/bytes with a Python 2 str/bytes/unicode? Let's think about it. The future module by Ed Schofield forbids py3bytes + py2unicode, but supports other combinations and upcasts them to their Python 3 version. So, for instance, py3str + py2unicode -> py3str. This is a consequence of the way it tries to make Python 2 string literals work a bit like they're Python 3 unicode literals. There is a big drawback to this approach; a Python 3 bytes is not fully compatible with APIs that expect a Python 2 str, and a library that tried to use this approach would suffer API breakage. See this issue for more information on that. I think since we have the magical power to change the interpreter, we can do better. We can make real Python 3 string literals exist in Python 2 using __future3__. So while we upcast existing Python 2 unicode strings to Python 3 str we refuse any other combination. Why not let people combine Python 2 str/bytes with Python 3 bytes? Because the Python 3 bytes object is not compatible with the Python 2 bytes object, and we should refuse to guess and immediately bail out when someone tries to mix the two. We require an explicit Python 2 str call to convert a Python 3 bytes to a str. This is assuming that the Python 3 str is compatible with Python 2 unicode. I think we should aim for making a Python 3 string behave like a subclass of a Python 2 unicode. We can now start using Python 3 str and Python 3 bytes in our Python 2 codebases, incrementally upgrading, module by module. Libraries could upgrade their internals to use Python 3 str and bytes entirely, and start using Python 3 str objects in any public API that returns Python 2 unicode strings now. If you're wrong and the users of your API actually do expect str-as-bytes instead of unicode strings, you can go deal with these issues one by one, in an incremental fashion. For compatibility you can't return Python 3 bytes where Python 2 str-as-bytes is used, so judicious use of __past__.str would be needed at the boundaries in these cases. People who have ported their code to Python 2.8 and have turned on all the __future3__ imports incrementally will be in a better place to port their code to Python 3. But to offer a more incremental step, we can have a Python 2.9 that requires the __future3__ imports introduced by Python 2.8. And by then we might have thought of some other ways to smoothen the upgrade path. There will be no Python 2.8. There will be no Python 2.8! Really, there will be no Python 2.8. Large code bases in Python need incremental upgrades. The upgrade from Python 2 to Python 3 is not incremental enough. A Python 2.8 could help smoothen the way. A Python 2.8 could help polyglot libraries. A Python 2.8 could let us drop support for Python 2.7 with an obvious upgrade path in place that brings everybody closer to Python 3. The old __future__ imports are mandatory in Python 2.8 (except unicode_literals). We introduce a new __future3__ in Python 2.8. __future3__ because we can support it in Python 3 today. We introduce from __future3__ import new_classes, mandating new style objects for plain class statements. We introduce from __future3__ import explicit_literals, str, bytes to support a migration to use Python 3 style str and bytes. We introduce from __past__ import bytes to be able to access the old-style bytes object. A forward port of the Python 2 bytes object to Python 3 would be useful. It would error if combined with a Python 3 str, just like the Python 3 bytes does. A future Python 2.9 could introduce more incremental upgrade steps. But there will be no Python 2.9. I'm not going to do the work, but at least now we have something to talk about.